I happened to see the image above on Twitter today (via @tomtomorrow), and then someone else posted the image to the right, which is how this item appeared in the 1965 Kenner toy catalog. It seemed appropriate for a Father’s Day post. That’s probably a toy rifle little Billy’s got there, but that might depend on the state. Anyway, I noticed that in the fine print of the catalog page it says “Patent Applied For.” Maybe so, but if it was, I couldn’t find a patent or an application for exactly this item. (My patent-searching skills are moderate at best, I should say.) I did find a few others, though. I have no doubt that there are similar inventions of various kinds going back centuries, but the earliest one I could find right on point was patented in 1986. The inventor begins this way: “It has been known in the prior art, that is, the idea or concept of an adult person, such as the father of a child, positioning himself on his hands and knees and then having a young child ride on his back.” Yep, that’s been known in the “prior art” for a while now, if by “prior art” you mean human history, because this idea or concept probably goes back a couple million years. He continues: “This exercise, of course, is very entertaining from the standpoint of a minor child and provides satisfaction for the adult person, such as the father, as well. 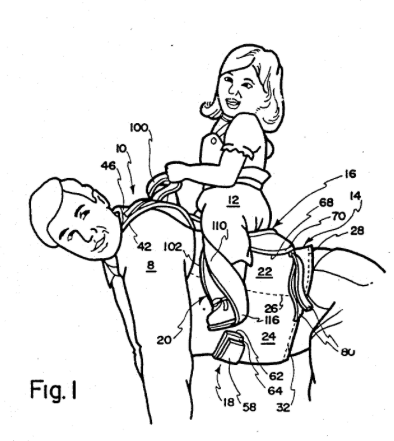 This exercise as described can, of course, be greatly facilitated and made much closer to simulation of actual horseback riding by providing what is in effect a saddle to be strapped to the back of the adult person. To the knowledge of the herein inventor, such an article as this has never before existed, and accordingly, the possibilities of such an article have not been exploited nor have the benefits or advantages thereof been available.” That last part (“never before existed”) seems pretty doubtful, but he did get a patent. One of the more comical aspects of patents—relatively speaking, I mean, not that patents are hilarious—is the part where the inventor explains why there is such a dire need for the invention he or she is proposing, either in general or because the prior art just doesn’t cut it. In this case, I thought the guy went a little overboard in explaining why his proposed stability improvement was necessary. 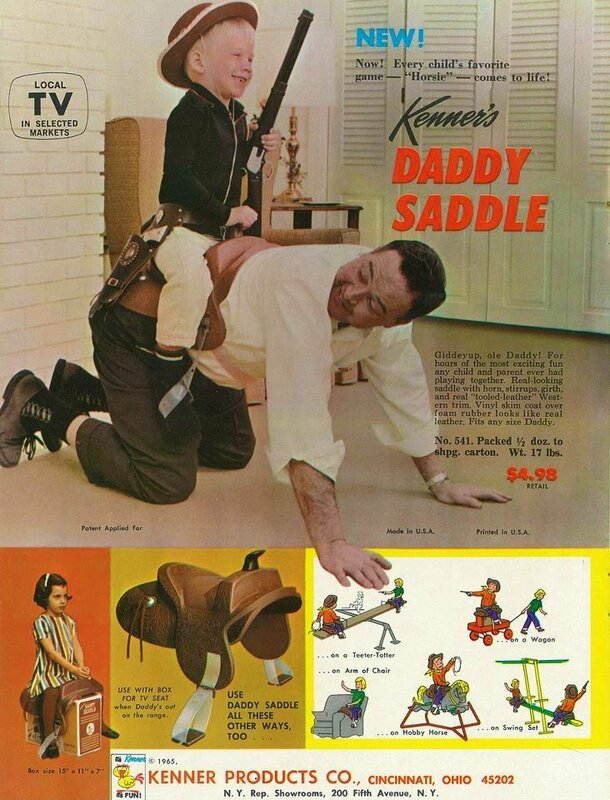 “Initially,” the inventor notes, “an adult gave piggyback rides without the benefit of any ‘saddle’ device.” I assume he’s just speculating here, although he makes it sound like there’s an example in the Bible or something like that. Whenever this historical piggyback ride took place, probably now lost in the mists of time, it apparently didn’t go that well. “As the child was given a ride, the child would typically pull and tug on the adult’s hair, neck, face or collar causing discomfort and sometimes minor injury to the adult. Sometimes the child will cover the adult’s eyes with his or her hand, obscuring the adult’s vision and risking an accident.” He doesn’t cite any examples of such catastrophic piggyback accidents, and in my limited experience fathers typically don’t reach very high speeds during this activity. Maybe someone piggybacked off a cliff? In any event, the improvement here was to rider stability, not crash protection, so I’m not sure his intro was really on point. Actually called “Daddy Saddle,” this is just a design patent, and the only real distinguishing feature I think is the addition of a tail. To me that seems to be going too far, and is even a little disturbing for some reason I can’t articulate and am now going to stop thinking about. Maybe he means his method is novel, but the idea itself has occurred to people before, I think. Anyway, thanks to the dads who lugged us around with or without special harness technology, especially the ones willing to look completely ridiculous and/or risk plummeting over cliffs during horsie rides. Now that we know the potential danger involved, you seem more heroic than ever.